Acting like a sponge, Fowl Meadow absorbs massive quantities of flood waters and protects communities downstream, mainly Boston and Milton. The year started off with some interesting weather. After a long period of bitter cold, we had about 16 inches of snow on the ground, and lots of ice around on rivers and ponds. Then we had a sudden warm snap, followed by 2-1/4 inches of warm rain (as measured at the Norwood Airport) on Wednesday night (1/12/18) into Thursday morning (1/13/18). The combination of rapidly melting snow and a respectable, but not drastic, amount of rain made for higher water levels than you might expect, and even for minor flooding in some areas. The impact of that rain on the Neponset River, its tributaries and its watershed tells a fascinating story about our shared landscape, some of the choices we’ve made about protecting land and habitats over the last 400 years, and how we need to think about preparing for the much bigger storms and droughts that we will increasingly see in the future with continued climate change. 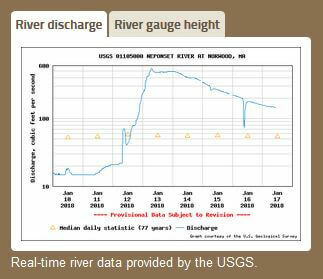 A “hydrograph” is simply a graph of how much water is discharging down a stream over time, and it’s one of the most basic and important tools for water scientists (aka hydrologists). The Neponset Watershed is lucky to have five streamflow gauges, operated by the US Geological Survey, that continuously monitor streamflow. The results are reported almost instantly online and you can see them right on or homepage or in more detail at our streamflow page. The upper part of the Neponset Watershed has two major “branches” each with its own stream gauge. 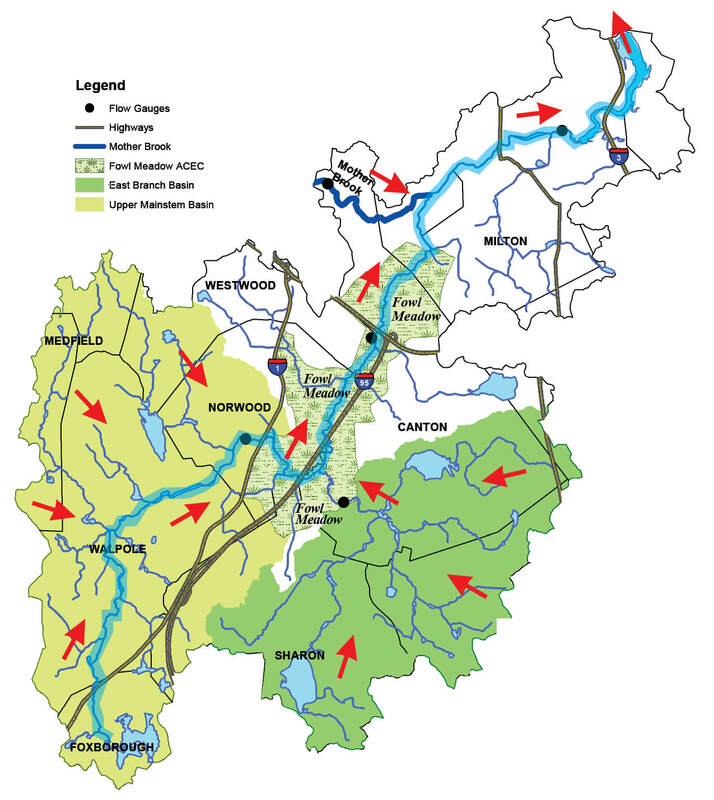 The Upper Neponset Mainstem is measured in Norwood near Route 1, and tracks the flow generated by 35 square miles of land that stretches all the way up to Foxborough, Walpole, Medfield, parts of Westwood and even a bit of Dover. To the east is (not surprisingly) is the East Branch of the Neponset River. 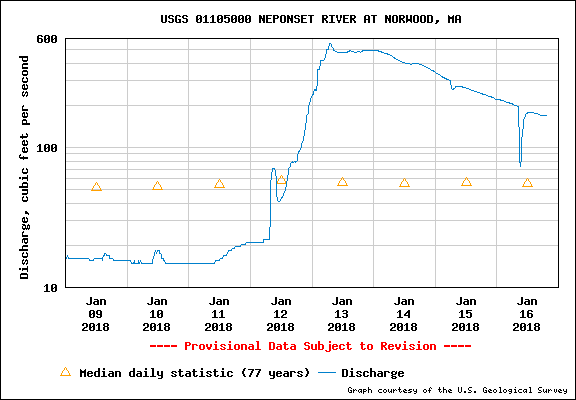 As the hydrograph for the Norwood gauge shows, there was a pretty good flow on the Upper Mainstem. The river went from a flow of about 10 cubic feet per second or “CFS” to about 600 CFS over about 24 hours. The speed at which the river flows rose was, in part, a function of the relatively steep slopes upstream of the gauge, combined with a generous amount of man-made pavement that keeps rain from soaking into the ground. The river peaked early in the morning of 1/13 and slowly began to recede. At the peak, this was a “5-year flood” on the Upper Mainstem. 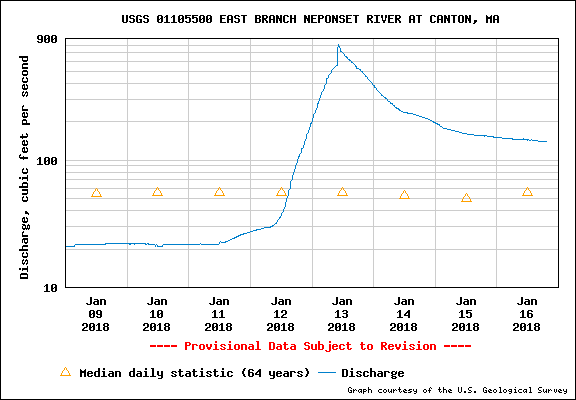 Things were quite a bit more exciting, over on the East Branch of the Neponset River near Canton Center, which drains Sharon, Stoughton and Canton. In spite of having a substantially smaller drainage area (27 vs 35 square miles), flows on the East Branch were 50% higher than on the Mainstem, spiking all the way up to 900 CFS, but taking a couple extra hours to get there. This amounted to roughly a “10-year” flood for the East Branch, likely the result of heavier rainfall or thicker snow pack to the east. You can see the graph below. As you continue downstream, the East Branch and the Upper Mainstem meet, in the area where Neponset Street crosses Route 95. Bringing together the 600 CFS from the west with the 900 CFS from the east for a total of 1,500 CFS. Right? Wrong. When it comes to hydrology, sometimes things don’t add up. That’s because the landscape where the Upper Mainstem and the East Branch meet is totally different. It’s not steep, but instead it’s dead flat for 8 miles. The river channel is more natural, and the land along both sides of the river is largely undeveloped, with large expanses of wetlands and floodplain extending out to the east and west. 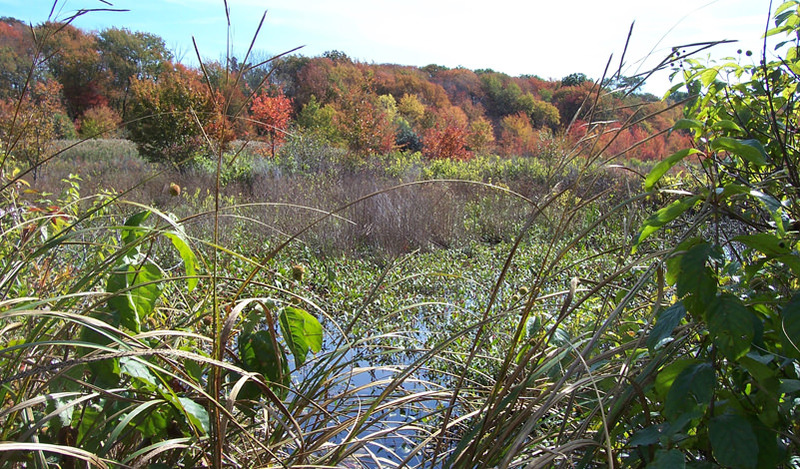 This area, in the middle of the Neponset Watershed, was once a glacial lake, and today is known as “Fowl Meadow.” It is a great wildlife habitat, a great recreational area, a great drinking water source, and most importantly for our story, a great sponge. 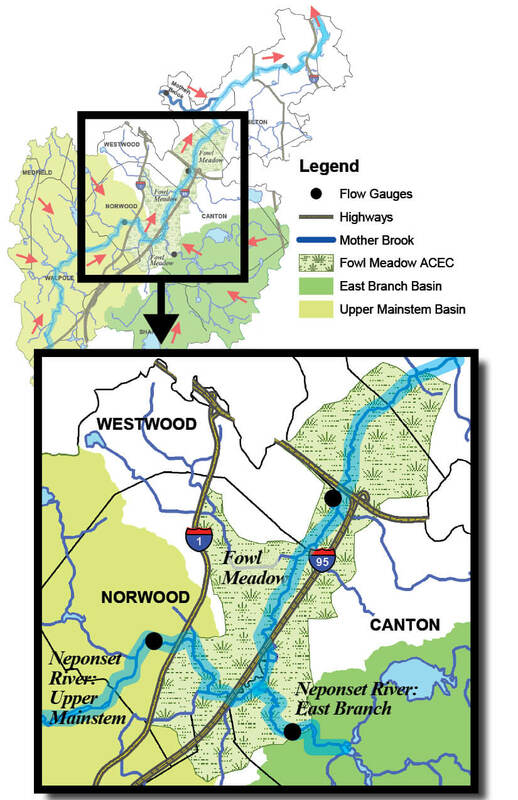 What happened to that 1,500 CFS of flood water as it rushed down to Fowl Meadow? 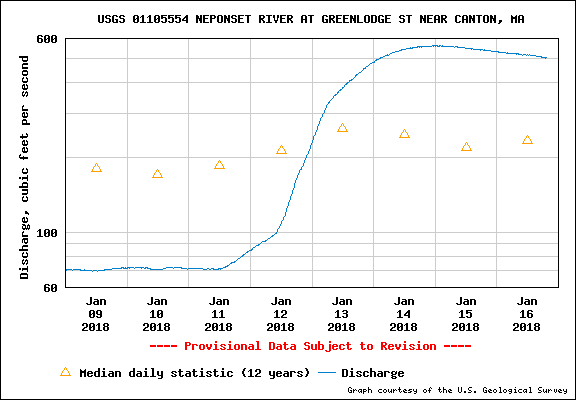 Take a look at the hydrograph for the Greenlodge Street (aka Fowl Meadow) streamflow gauge near Route 128. That’s right, the Fowl Meadow had 1,500 CFS coming in, but at its peak, was letting out less than 600 CFS! Look carefully and you’ll also see that the Fowl Meadow not only made 900 CFS of water disappear, but it slowed down the peak runoff by fully 36 hours! That’s really important, because what’s right downstream of Fowl Meadow? Boston and Milton. The most densely developed area in the whole watershed, with the most pavement contributing rapid runoff to the downstream floodwaters, and the most people and property that could be damaged in a major flood event. How did the Fowl Meadow slow things down and make them disappear? By letting the floodwaters spread out over a large area of natural wetlands and swamps in the floodplain. In fact, this is exactly the way nature designs things, to prevent and absorb floods. The trouble is, humans very often have thought it would be better to just fill in those floodplains for development. Perhaps the Neponset Watershed Association’s greatest accomplishment was successfully blocking a plan to do just that in the Fowl Meadow in the 1960’s. Today, this idea of protecting and preserving the natural areas that protect us has a catchy name intended to give our floodplains the credit they deserve for saving our bacon when it rains: green infrastructure. Aside from making floodwaters seemingly disappear, Fowl Meadow does another very important thing for Boston and Milton. It lets them cut the line. All that pavement in Boston means that when it rains, water runs off to the river very quickly, causing a big spike in floodwater and then it recedes just as fast. By holding back the water from upstream, Fowl Meadow lets the city water get out to sea first, before the flood water from upstream arrives. This prevents a much, much bigger flood peak that would occur if all that water were arriving at once. 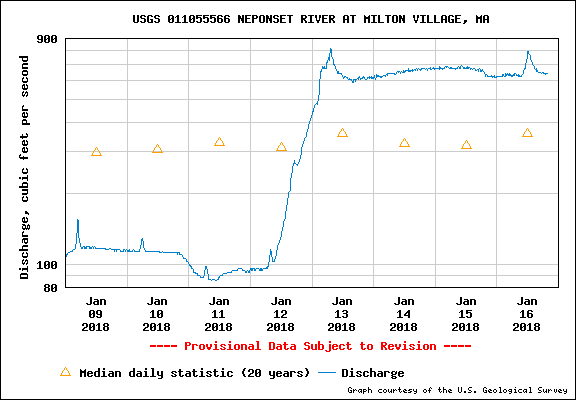 As you can see in the hydrograph from the Milton Village streamflow gauge (aka the Dorchester / Milton Lower Mills gauge), the River peaks very early in the city because of all that pavement, even before the East Branch of the Neponset peaks upstream, but then it drops very quickly. And finally over the next day or two, the river starts to rise a bit in Lower Mills as the flow that’s been held back in Fowl Meadow finally begins to arrive downstream. The one other piece of this story is Mother Brook. Mother Brook is a man-made diversion out of the Charles River and into the Neponset. 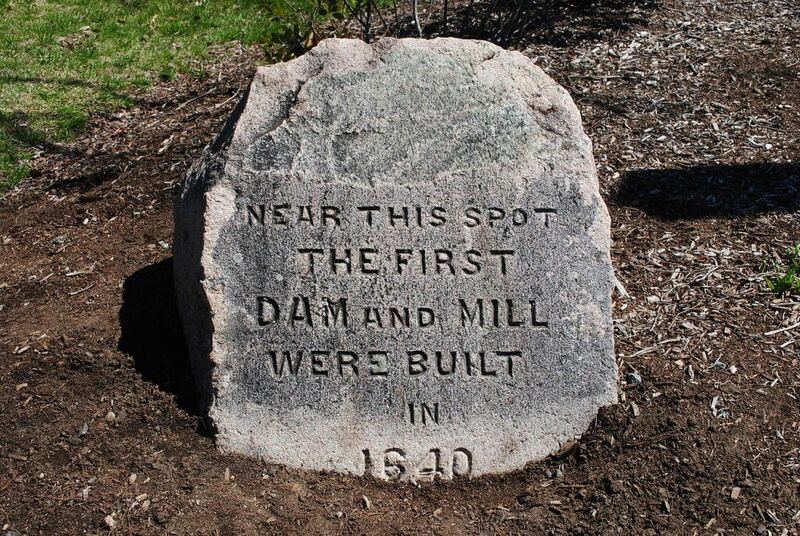 Built in the early 1600’s it was the nation’s first canal and was built to drive water powered industries. Mother Brook enters the Neponset in Hyde Park, halfway between the Fowl Meadow and Lower Mills stream gauges. In the 1960’s, Mother Brook was re-purposed by the Metropolitan District Commission, for the benefit of downstream communities on the Charles. By diverting water from the Charles into the Neponset via Mother Brook during floods, the state reduces flooding on the Charles while increasing peak water levels on the Neponset. 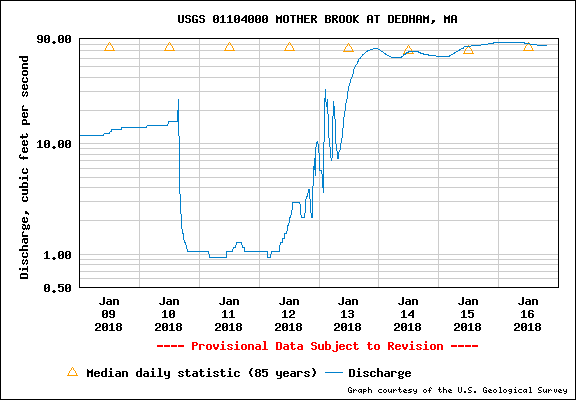 Mother Brook didn’t play a major role in the story of this relatively modest storm, but a peek at the Mother Brook Hydrograph is interesting nonetheless. Even though this was a relatively minor flooding event, it very nicely illustrates how natural features combine with 400 years of land use decisions to determine whether people are wiped out by flooding, or if they just go about their business oblivious to the drama playing out down by the river. Rainfall events are getting bigger (especially the big ones) in our communities and across New England. In fact, New England has already observed a more drastic increase in the size of large storms than anywhere else in the country, and that’s based on actual rainfall measurements, not modeling of the future. Protecting our “green infrastructure” like Fowl Meadow will be more important than ever in the coming decades, but we also increasingly will need to think about proactively restoring some of the many streams than have been channelized, culverted or dammed, and floodplains that have been filled across the Neponset. Very interesting and persuasive, Ian. I wonder if the Globe would be interested in a version of it?